Do you ever get “laptop freeze”? No, I don’t mean when your laptop freezes, and you have to restart it or hit it to get it working again. I mean the situation when you’ve planned to sit down and do some serious work. You have no idea what you’re going to do and no idea where you need to go to do it. One of the problems here, especially when it comes to using the internet to study English, is that you need to know where to go. The internet is a smart animal, and there are loads and loads of ways we can use it to make learning English effortless, enjoyable and productive. 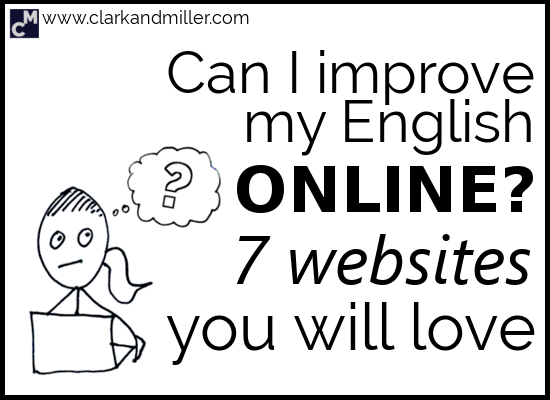 Here are 7 websites you can visit to level up and make learning English enjoyable. I find myself getting addicted to this site. For many of us, the most difficult thing about listening to a foreign language is that it’s easy to lose concentration after just a few minutes and start thinking about what we’re having for dinner or whether that dog we saw really did have two noses. But what if you only had to listen for just ten seconds? Much easier, much more fun and much more addictive. You’ll see (and listen to) a very short video clip. You’ll then see two options, each of them providing a possible summary of what the clip means. Click on the right one! Or die! Or just click on the right one. Apart from the fact that it’s very, very addictive, it’s also a great way to hear (relatively) natural English at normal speed. Also, because it’s addictive, you’ll suddenly find yourself an hour later having just practiced your listening all that time without realising it. Finally, if you’re finding it a little too difficult, there’s always the subtitle option. Another fun way to practice listening, but this time with music. You watch a music video, and you have to fill in the gaps when they say the words. Well, it’s surprisingly difficult. But also wildly addictive. Of course, songs are not the most natural form of English … at all. I mean, in the real world, we don’t spend all our time repeatedly saying how beautiful the person we’re talking to is or moaning about how we’re so sad since she left, and life will never be the same. Unless you’re Sam. Sam always does that. However, like Voscreen, this site is super addictive and fun. And when things are fun, we spend more time on them. And more time engaging with English, even with love songs by insincere-looking pop stars, is still time well spent. For those of you who like to get a little more detailed (or who can’t stand pop songs), Lingorank offers you something a bit more technical. The concept is simple: listen to a 5-minute video and do a series of exercises. Head over to lingorank.com. Just play the video and follow the instructions on the right. Sometimes you’ll need to fill in the gaps. Sometimes you’ll click on the words as you hear them. Sometimes it teaches you the meanings of the tricky words so that you can understand the video better. And sometimes it makes you a cup of tea and some carrot cake. OK. One of those might not be true. Because most of the videos are from presentations and TED talks, the language is quite formal, which is great if you’re preparing for a more academically oriented test like IELTS or TOEFL. Grammarly works as an extension to your browser or phone. It’s a bit like having a teacher looking over your shoulder all the time while you write. Except a bit less creepy. If you make any mistakes — either grammatical or spelling — it tells you so you can go back and fix them! A bit like the grammar check on Microsoft Word — but much more sophisticated. I think Grammarly is very useful, but it can also get in the way of development, so use it carefully! It’s great if you’re writing an email to someone really important, and you want to double-check your writing. It’s great if you’re writing a story, a report or just your diary, and you want to analyse your mistakes. But don’t rely on it too much! If you use it to make sure your writing is slick and impressive, that’s great. But remember to take the time to look at why you made a mistake and to try to understand what the problem is. It’s great to make mistakes, but we need to learn from them, not just let the computer correct them without us thinking about it. And he should know. He wrote A LOT of books. But it’s difficult to just sit down and start writing, right? That’s where Storybird can help. With Storybird, you start with the artwork, then you write the story. Head over to storybird.com, click on “create” and get started. You can choose from a massive range of artwork styles. Choose one and start writing your story. You can choose between a longform book, a picture book or a poem. If you’re starting out, I’d recommend going for the picture book — one picture per page. Here’s what I started with …. As humans, we react very strongly to images — a blank page can be a nightmare, but a selection of images is a great starting point. Getting started is the tricky bit, but once you’ve begun, you’ll be surprised how creative you are. And remember: it doesn’t have to be good. No one’s going to see it — just enjoy writing. Like Terry. This site is really simple: you search for a word, and you get lots of recordings of different people saying that word. Go to forvo.com, search for a word and check out the different recordings. Each recording is from a different person, so you can listen to a range of accents. So how is this different from Google Translate or the pronunciation function of the Oxford Dictionary? Well, you get to hear from different people from different parts of the world (mostly UK and US). It’s 100 times more natural than the rather robotic voices on Google or the dictionary websites. So you’ve found an interesting article about the past perfect that you love. There’s also this awesome YouTube video about Newcastle English you want to share with the world. And not forgetting that really cool PDF document your English teacher sent you with interesting vocabulary and weird pictures. And what about that excellent piece of writing you did? Well, you can put it all up here — on your Pearltrees account. But instead of random phone numbers, shopping lists and that rather ugly postcard from your mad uncle, you can add any sort of media. So it can be like your own personal English-learning media collection. You can go there whenever you want to find something to do in English, or you could share it with the world and start helping other people, too. Just head to pearltrees.com, sign up and start your collection! It’s very, very, very useful. You’ve got everything you need all in one place. You can also search for other people’s collections — so it’s a great way to discover new stuff. ELTpics is a Flickr page with thousands of useful pictures for teaching. Have you spent hours looking for that perfect picture, just so you can show what “crowded” means or so you can play a guess-the-image game? Or maybe you want to introduce the topic of Halloween or medical disasters or giraffe tennis with a picture. Then you can find it here. Probably. It. Saves. So. Much. Time! OK — there’s a lot there, right? My suggestion is to start with Pearltrees: open an account and then start adding the other resources to it. You’ll be deep in the internet world of English in no time! But have I missed anything? Is there something you’ve found that I haven’t included here? If so, then please share it with me in the comments below! I´d like to thank you very, very much for this post. Your suggestions are really excellent. The only one I Know is “Grammarly” and it ´s great. Again, thanks a lot, Clark. Good luck discovering these great sites and let me know if you set up a Pearltrees page! I´d like to thank you very much for this excellent posts. Websites are really fabulous!!! Thanks very much for your detailed suggestions, I will try them during the holidays. I already know Lyrics training and it’s really addictive, as you say. Thanks a lot Gabriel! You’re as always very helpful!)))) I definitely add them to my list of useful sites. Wow — thanks Elena. I’m glad these tips are reaching out and helping people like you. Keep up the good work! Thanks Clark for your post! Your articles are always fun and sooo helpful. I use busyteacher.org to find a lot of great ideas for teaching English. Yes – busyteacher is also a really useful resource. Good work! Thank you, Gabriel! It’s very, very useful! Great post! I’m looking forward to checking out some of the ones I haven’t heard of before and sharing them with my students. Thanks a lot, really interesting!! I would like to thank you for such useful and enjoyable stuff you share. I have been teaching English as a second language in Turkey for about 7 years now. Every day, I look for something new that will both improve my own teaching skills and also make the language acquisition process funnier and more interesting for my students. Additionally, you know that we, as teachers, should keep our own knowledge and skills concerning the language we teach up-to-date. Your posts will definitely be of great help. So THANK YOU! Wow — what a wonderful comment. Thanks for the high praise, Olcay. It’s great you’re keeping your skills sharp and up-to-date, well done! It’s sometimes easy to slip into the same old routine and then let your teaching get repetitive and dull. So good work!